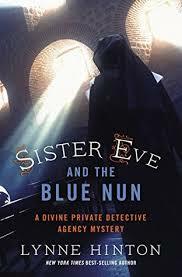 Sister Eve Divine, the motorcycle riding nun who moonlights as a private detective is on a new case in Sister Eve and the Blue Nun. As well as investigating a murder, Sister Eve is at a crossroads in her life. The monastery where she has lived and worked for many years has suddenly banned the nuns who lived there. They have all had to leave their longtime home and find new orders to join. In Sister Eve's case, she has moved back home with her father, retired police Captain Jackson Divine who now runs a detective agency. Sister Eve is back at the monastery in order to attend a conference about the 17th century Sister Maria de Jesus de Agreda. Sister Maria hasn't yet been declared a saint, but she performed the miracle of bilocation -- living in Spain and yet also appearing at the same time to the Native American Jumano Indians in what is now New Mexico. The featured speaker at the conference, Dr. Kelly Middlesworth, is going to drop a bombshell during her speech: that writings from Sister Maria have been discovered that prove she actually visited New Mexico. Dr. Middlesworth got these writings from her brother, Anthony, who is a monk at the monastery. While he was doing some work at a remote church, he found the writings and smuggled them out to show his sister. He only intended to show them to her before returning them to their rightful place at the church, but Kelly is determined that the world should know of their existence. The evening before her speech, however, she is found dead in her room at the monastery. It is her brother Anthony who finds her, and instead of calling for help, he immediately goes to Sister Eve for help. Eve confirms that Kelly is dead and begins looking around the room for clues as to what happened. She suspects that Kelly was poisoned. As she's investigating, Father Oliver, the head of the monastery arrives. Anthony also told him of his sister's death. As the two of them try to decide what to do, the police arrive. Who called them remains a mystery. It soon transpires that Anthony, after leaving behind a somewhat incriminating letter for Father Oliver, has disappeared. Eve knows that Anthony wouldn't have harmed his sister, but who did have a motive to kill her? And where are the writings of Sister Maria that are missing from Kelly's room? As Eve determines to get to the truth, she's thrown an unexpected curve ball in the person of a hunky police detective, Earl Lujan. Whenever he's around doing questioning, Eve begins to feel all lightheaded. Surely there's not a romance on the horizon??? The book progresses with Eve putting herself in dangerous situations while trying to get at the truth. At the same time, she struggles with trying to decide what she should do with her life. She hoped to stay at the monastery, but the archbishop has, for unknown and unexplained reasons, decided that the monks and nuns can no longer live together and the nuns must go. After taking a vow of obedience, the nuns have no choice but to leave, but the whole thing doesn't sit well with Sister Eve. She begins to question her future as a nun, as well as whether women have ever had a place in the church. The mistreatment of Sister Maria, who was questioned repeatedly by the Inquisition during her lifetime, has echoed down through the centuries and shown that women are still being treated as second-class citizens by the male-dominated church. This is the third book in the Sister Eve series, so I'm sure there are more to come. It will be interesting to see what Eve decides to do with her life (although she seems to enjoy poking her nose into other people's business and listening outside doors too much to give up being a private detective). It will also be interesting to see if anything develops with Detective Lujan in the romance department, something I'm sure Sister Eve hadn't expected in her life!